In this section, a short overview of the use and general principle of scintillation detectors is presented. Scintillation crystal parameters in relation to the application are discussed. A scintillator is a material that converts energy lost by ionizing radiation into pulses of light. In most scintillation counting applications, the ionizing radiation is in the form of Xrays, γrays and α or βparticles ranging in energy from a few thousand electronvolts to several million electron volts (keVs to MeVs). Pulses of light emitted by the scintillating material can be detected by a sensitive light detector, often a photomultiplier tube (PMT) The photocathode of the PMT, which is situated on the backside of the entrance window, converts the light (photons) into socalled photoelectrons. The photoelectrons are then accelerated by an electric field towards the dynodes of the PMT where the multiplication process takes place. The result is that each light pulse (scintillation) produces a charge pulse on the anode of the PMT that can subsequently be detected by other electronic equipment, analyzed or counted with a scaler or a rate meter. Alternative ways to convert scintillation light into an electrical signal are Silicon photodiodes (PDs) or Silicon photomultipliers (SiPms). The operation principles and different characteristics of these are discussed in a separate section. The combination of a scintillator and a light detector is called a scintillation detector. Since the intensity of the light pulse emitted by a scintillator is proportional to the energy of the absorbed radiation, the latter can be determined by measuring the pulse height spectrum. 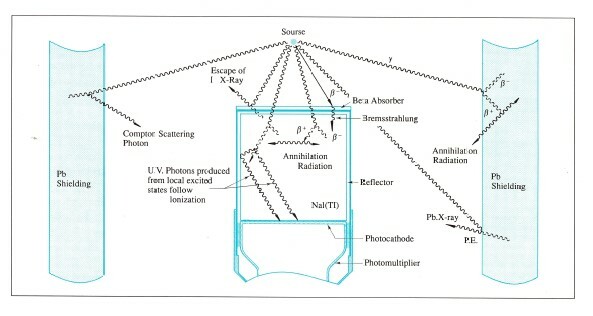 To detect nuclear radiation with a certain efficiency, the dimension of the scintillator should be chosen such that the desired fraction of the radiation is absorbed. For penetrating radiation, such as γrays, a material with a high density is required. Furthermore, the light pulses produced somewhere in the scintillator must pass the material to reach the light detector. This imposes constraints on the optical transparency of the scintillation material. When increasing the diameter of the scintillator, the solid angle under which the detector “sees” the source increases. This increases the detection efficiency. 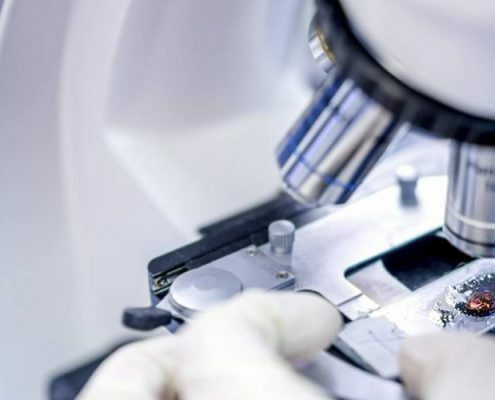 The ultimate detection efficiency is obtained with so-called “well counters” where the sample is placed inside a well in the actual scintillation crystal. The thickness of the scintillator is the other important factor that determines the detection efficiency. For electromagnetic radiation, the thickness to stop say 90% of the incoming radiation depends on the X-ray or γ-ray energy. For electrons (e.g. β-particles) the same is true but different dependencies apply. For larger particles (e.g. α-particles or heavy ions) a very thin layer of material already stops 100% of the radiation. The thickness of a scintillator can be used to create a selected sensitivity of the detector for a distinct type or energy of radiation. Thin (e.g. 1 mm thick) scintillation crystals have a good sensitivity for low energy X-rays but are almost insensitive to higher energy background radiation. 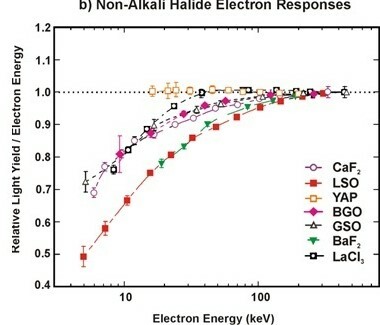 Large volume scintillation crystals with relatively thick entrance windows do not detect low energy X-rays but high energy gamma rays are measured efficiently. Electromagnetic radiation can interact with matter via 1. photoelectric effect, 2. Compton effect or 3. pair production. 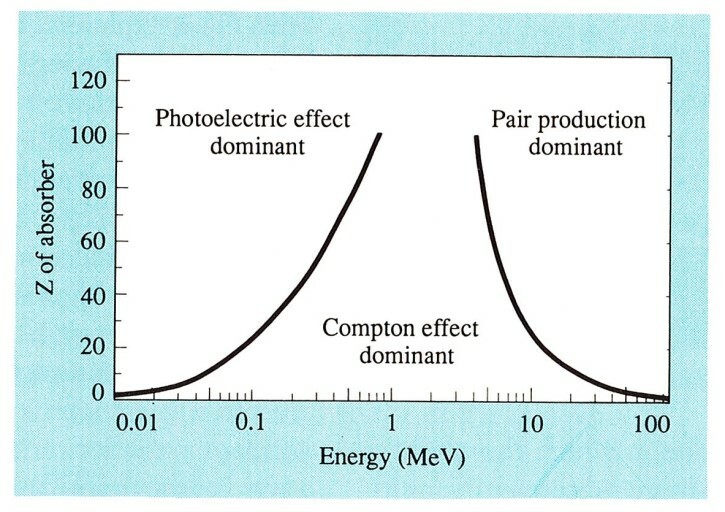 Effect 3 only occurs at energies above 1.02 MeV. In practice, all effects have a chance to occur, this chance being proportional to the energy of the radiation and the atomic number (Z-value) of the absorber (the scintillation material). In the Photoelectric effect, all energy of the radiation is converted into light. This effect is important when determining the actual energy of the impinging X-ray or gamma-ray photons. The lower the energy and the higher the Z-value, the larger the chance on photo effect. In real applications several interaction processes play a role. Fig. 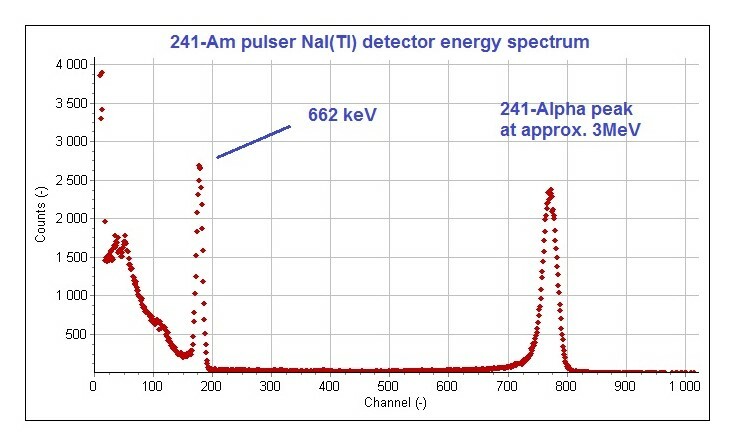 2.1 shows a typical pulse height spectrum measured with a 76 mm diameter, 76 mm high NaI(Tl) crystal in which the radiation emitted by a 137Cs source is detected. The photopeak, Compton maximum and backscatter peak are indicated. The lines around 30 keV are Ba X-rays also emitted by the source. The total detection efficiency (counting efficiency) of a scintillator depends on the size, thickness and density of the scintillation material. However, the photopeak counting efficiency, important for e.g. 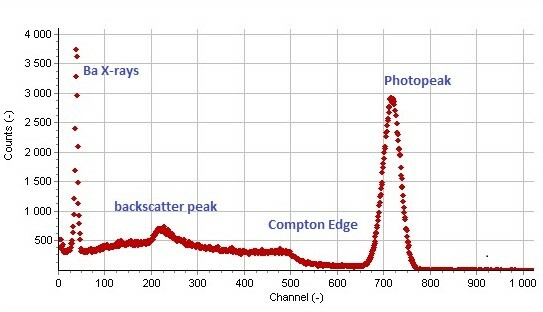 gamma-ray spectroscopy, is a strong function of and increases with the Z4-5 of the scintillator. At energies below 100 keV, electromagnetic interactions are dominated by the photoelectric effect. Electrons (e.g. β-particles) can be backscattered from a material which implies that no energy is lost in the interaction process and the particle is not detected at all. The backscattering fraction is proportional to the Z of the material. For NaI(Tl) the backscatter fraction can be as high as 30% .! This implies that for efficient detection of electrons, low Z materials such as plastic scintillators or e.g. CaF2:Eu or YAP:Ce are preferred. Also the window material is of importance. The basic principle of pulse height spectroscopy is that the light output of a scintillator is proportional to the energy deposited in the scintillation material. The standard way to detect scintillation light is to couple a scintillator to a photomultiplier. Furthermore, a γray spectrometer usually consists of a preamplifier, a main (spectroscopy) amplifier and a multichannel analyzer (MCA). The electronics amplifies the PMT charge pulse resulting in a voltage pulse suited to detect and analyze with the MCA. The schematic is shown in below. Alternatively, currently available digital techniques allow to directly digitize the (pre-amplified) pulses of the light detector (e.g. PMT or SiPm). Often programmable FPGA’s are used for this. The optimum digital filtering constant (just as analog shaping time) depends on the speed of the scintillation material. The combination of a 14 pins scintillation detector and a so-called “digital base” allows to construct a compact gamma spectrometer that can be operated via a USB or Ethernet port of a computer. An important aspect of a Gamma-ray spectrometer is the ability to discriminate between Gamma-rays with slightly different energy. This quality is characterized by the socalled energy resolution which is defined as the (relative) width at half the height of the photopeak at a certain energy. At low energies where photoelectron statistics dominate the energy resolution, the energy resolution is roughly inverse proportional to the square root of the γ-ray energy. In principle, the amount of light a scintillator emits per unit energy as a function of the energy is constant. However this is not the physical reality. This so called non-proportionality is vastly different for different scintillators and in the classic alkali halides it provides the limitation of the energy resolution in the MeV energy range. Below the proportionality of some typical scintillation materials is shown. Gamma ray interaction in materials includes photo-electric effect, Compton effect and pair production. Usually a combination of several of them takes place. Gamma ray interaction n materials results in the production of energetic electrons. A non-proportional electron energy versus light response leads to a broadening of the photopeaks. Term 1 is the proportionality; term 2 the contribution by the statistics (amount of light produced per interaction) and term 3 inhomogeneity effects in for example PMT or scintillator. 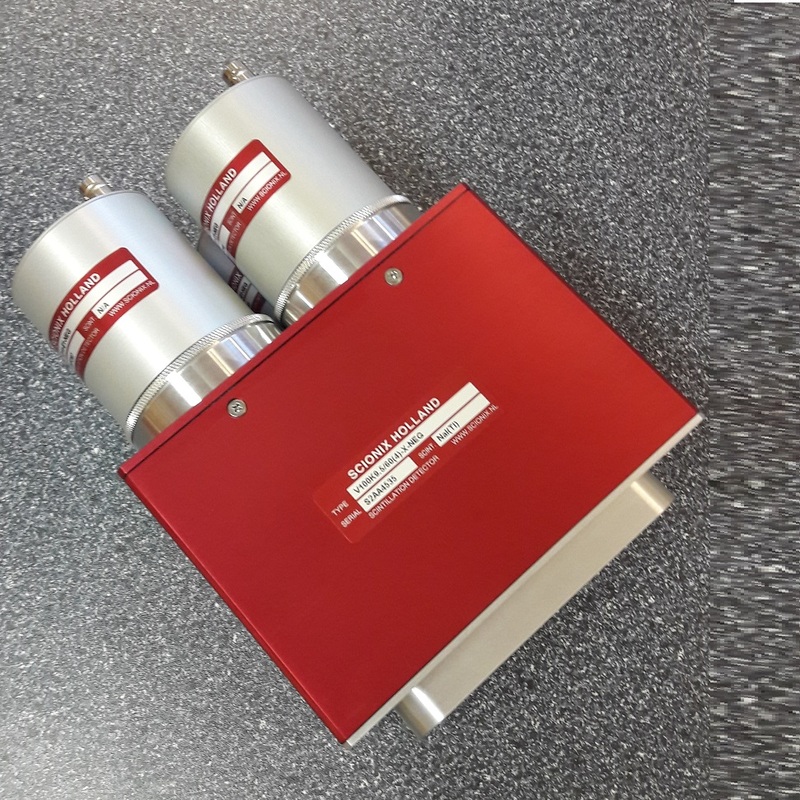 The energy resolution of a scintillation detector is a true detector property, limited by the physical characteristics of the scintillator and the PMT or other readout device. 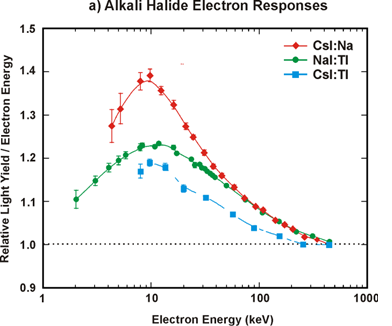 A typical energy resolution for 662 keV γrays absorbed in small NaI(Tl) detectors is 7.0 % FWHM. At low energies, e.g. at 5.9 keV, a typical value is 40 % FWHM. At these low energies, surface treatment of the scintillation crystal strongly influences the resolution. It may be clear that especially at low energies, scintillation detectors are low resolution devices unlike Si(Li) or HPGe detectors. The use of more proportional crystals like e.g. LaBr3:Ce, LBC, CeBr3 or SrI2(Eu) allows to achieve energy resolution numbers at 662 keV gamma rays down to the 3-4 % level. In the section on high resolution crystals more details are provided on proportional scintillation Crystals. The time resolution of a scintillation detector reflects the ability to define accurately the moment of absorption of a radiation quantum in the detector. The light pulse of a scintillator is characterized by a rise time and by a 1/e fall time τ (decay time see the section on scintillation properties It is obvious that the best time definition of an absorption event is obtained when the scintillation pulse is short (small decay time) and intense. Furthermore, the rise time and time jitter (also called transit time spread, TTS) of the PMT and of the electronics are important. For semiconductor readout similar properties apply. Small cm size NaI(Tl) detectors have typical time resolutions of a few nanoseconds for 60Co (1.2 MeV). Much better time resolutions can be attained with organic – or BaF2 scintillation crystals. BaF2 is presently the fastest known inorganic scintillator with detector time resolutions of a few hundred picoseconds. Also Cerium bromide (CeBr3) scintillators allow comparable time resolutions. 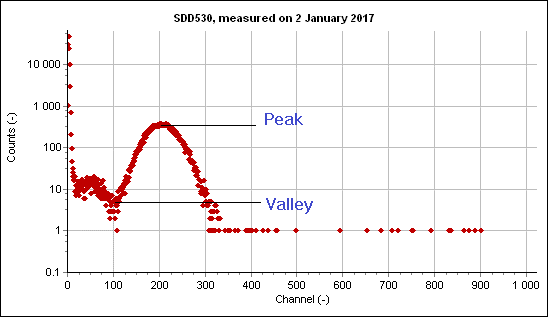 A sensitive way to check the energy resolution of a scintillation detector is to define a so-called peak-to-valley (P/V) in the energy spectrum. This criteria is not depending on any possible offsets in the signal. Either the peak-to-valley between two gamma peaks is taken or the ratio between a low energy peak and the PMT / electronical noise. A good P/V ratio for a 76 x 76 mm NaI(Tl) crystal is 10:1. This is equivalent to an energy resolution of 7.0% at 662 keV. 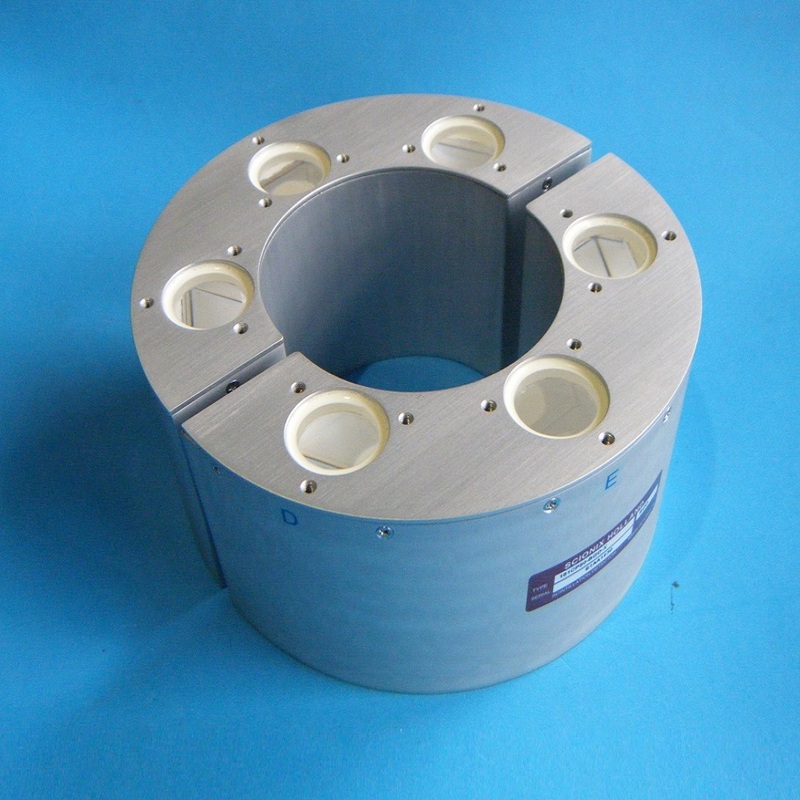 At 5.9 keV, a high quality NaI(Tl) X-ray detector can have a P/V ratio of 40:1. Large count rate changes and temperature variations may cause peak position variations in a spectrum. This effect is unavoidable in scintillation detectors since the light output of the scintillator and light detector amplification is (in most cases) temperature dependent. An additional program in the case of photomultiplier readout is hysteresis and memory effects in PMTs which complicates correction algorithms. In silicon photomultipliers this effect is not present. To compensate for these effects it is possible to calibrate the peak position with a so-called Am-pulser. This is a very small radioactive 241Am source mounted inside a scintillation detector. 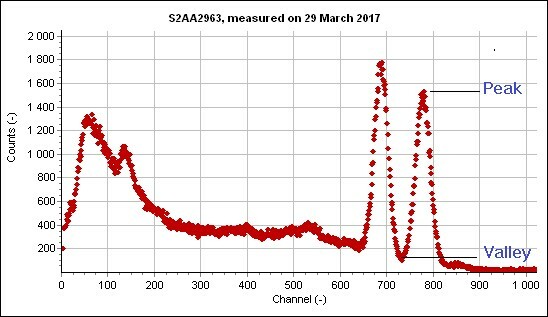 The α-particles, emitted by the 241Am, cause scintillations in the crystal that are detected by the PMT (or the photodiode) of the detector. For NaI(Tl), the α-peak is situated between a Gamma Equivalent Energy (GEE) of 1.5 and 3.5 MeV and can be specified. Count rates are typically 50, 100 or 200 cps. The position of the pulser peak is used as a reference to compensate for the above mentioned variations in detector response. The above way of calibration is not ideal since the response of most scintillation crystals for Gamma-rays and α-particles is different. However, a second order compensation using e.g. a thermistor is only necessary for large temperature ranges. For occasionally monitoring your system integrity, Light Emitting Diodes (LEDs) or laser ports can also be used. LEDs can be mounted inside scintillation detectors or a window for that purpose can be provided. Some special systems exist that intrinsically stabilize gain of the detector by injecting pulsed LED light into the light detector and by comparing it to the signal of a (stable) built-in semiconductor detector. Besides the above described ways of pulse height stabilization, it is of course also possible to stabilize electronically on the peak of an (always present) external source. Sometimes the 40K background line can be used for this purpose. Charged particles such as electrons, muons or charged particles (e.g. α-particles) lose energy through Coulomb interactions with the atomic electrons in the surrounding matter. When selecting a detector for charged particles, the primary consideration is the type of particle to detect. This includes low energy electrons, protons, α-particles and heavy ions. The rate of energy loss in matter increases as the charge and mass of the particle increase, but the conversion of particle energy in scintillation light decreases. The number of photons produced by an 5.4 MeV α-particle is only a fraction that produced by a gamma photon with the same energy. This fraction varies per scintillator and the so-called alpha/gamma ratio can vary between roughly 0.1 (organic materials) and 0.8 for some alkali halides. Separate from the emitted energy and the specific scintillator, the energy resolution for particles also depends on the surface treatment of the material. The following aspects should be considered. 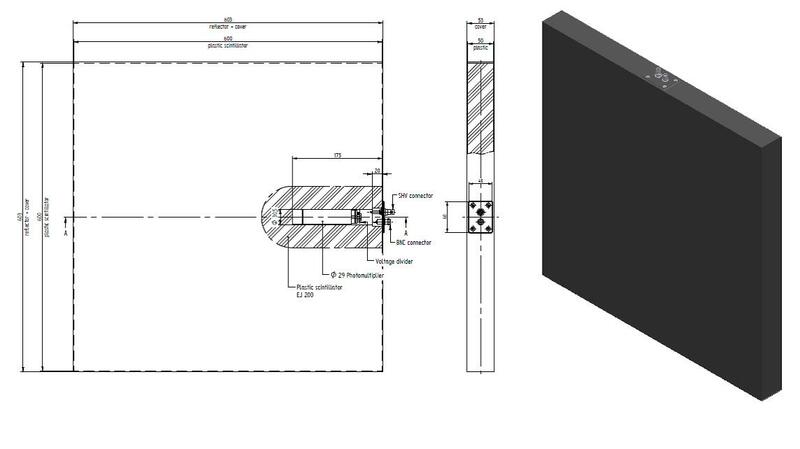 The entrance window of the detector should be very thin to minimize the energy loss. aluminized mylar windows are normally used. The thickness of mylar windows can vary between 2μm and 100μm. Layers of 2 micron double-sided aluminized mylar are never 100 % light-tight. Particles in this group are usually single charged with a low mass and a high energy. Their energy loss per unit path length is small. Common examples of minimum ionizing particles are cosmic muons and fast electrons. In a plastic scintillator, minimum ionizing particles lose several MeV per cm material. 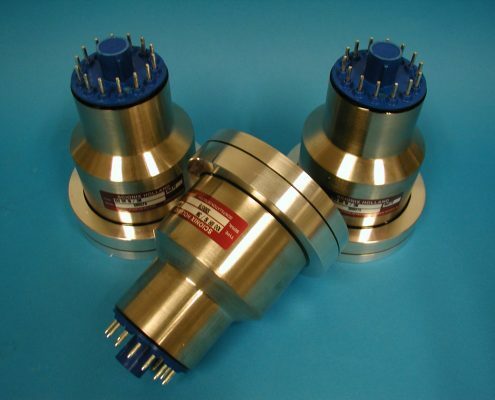 Applications include calorimetry and electron spectroscopy. Entrance window material and thickness are usually not that important since the particles normally pass through the window and the entire scintillator. An example of the detection of muons are so-called “muon suppression shields” built up out of large are plastic scintillators read out by PMTs that can be built inside the plastic scintillator. Since the deposited energies are large small single PMTs are sufficient to discriminate the muon signal above the gamma background. Muons suppression shields are usually custom-made. SCIONIX can offer matching electronics for such applications.